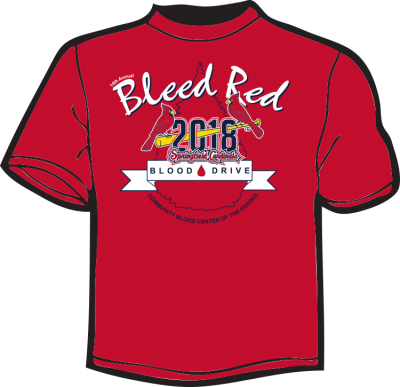 When you schedule your appointment online for the 2018 Bleed Red Blood Drive you will score an extra entry for the prize drawings. Double your chances! Schedule online now! Hot dogs (starting at 11:00 a.m.), chips and ice-cold Coca-Cola products at the blood drive! Participants will be automatically registered to win autographed Cardinals gear, upgraded ticket packages, other great prizes. You may even win the chance to throw out the first pitch at a Cardinals game! Share the excitement with others who plan to attend! Go click GOING on our Facebook event page HERE. To donate Monday, July 9, 2018, your last donation should have been May 14, 2018, or earlier. To donate Tuesday, July 10, 2018, your last donation should have been May 15, 2018, or earlier. In addition, donors must be at least 17 years old (or 16 with parental consent form available HERE), weigh at least 110 lbs. and be in general good health. Check your eligibility by signing in to our donor portal and accessing your account HERE. If you have questions about your eligibility (for example, if you are taking specific medications), please call 1-800-280-5337 or email us through our contact form HERE. Thanks, Lifesavers! We’ll see you at Bleed Red!